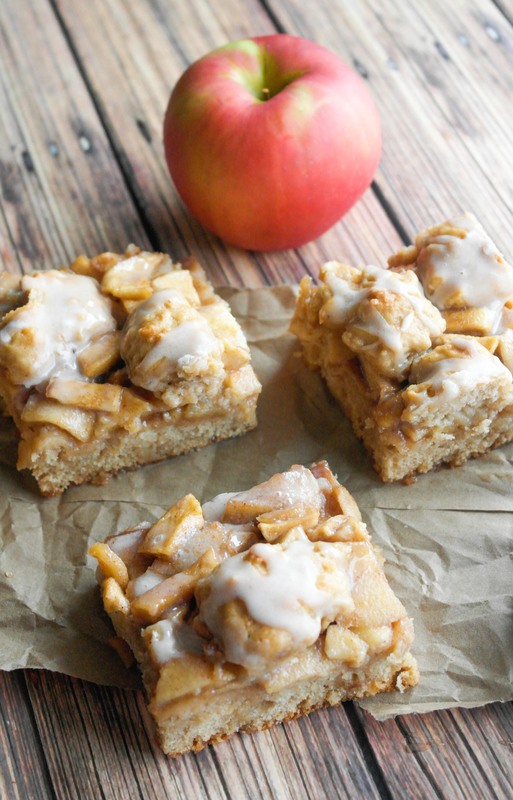 These apple pie bars with vanilla glaze have a soft, thick cinnamon cookie base. Top the cookie with four (yes four!) 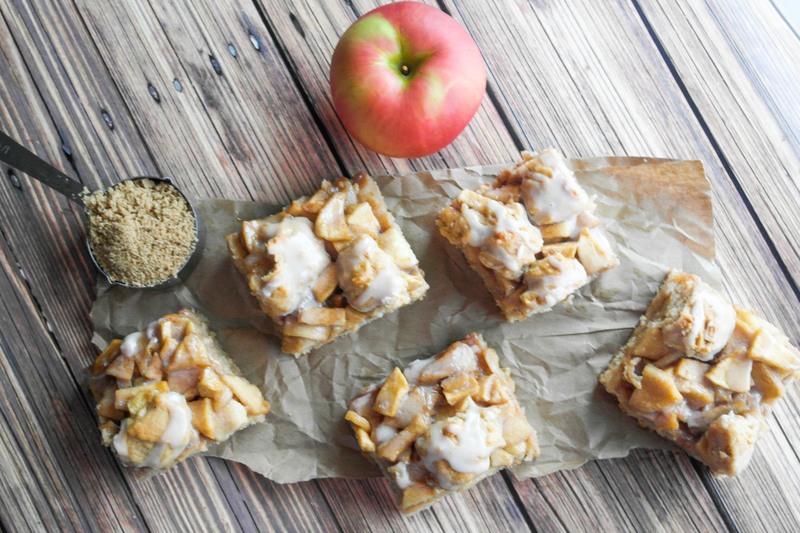 apples tossed in cinnamon and sugar and you have the most delicious apple bars ever. But these bars! Oh my goodness so delicious. I wanted the cookie base to cake-like, soft and thick and full of cinnamon, so I made a handful of cool, science-y modifications to my favorite sugar cookie base. The fundamental difference between cake and cookies is the total amount of liquid: the number of eggs (3-4 for cake, 1-2 for cookies) and the addition of liquid to cake (about 1/2 to 1 cup). Adding liquid to cookie dough will make them puff up more, much like a cake. So, I subbed half of the butter for a half cup of sour cream. This imparted liquid into the batter and made the cookies much more cake like. I put half of the cookie dough into the pan and baked it for 15 minutes. Bake the cookie base long enough until the middle is set. Try to avoid baking the cookie base long enough that is starts getting brown at the edges. You don’t want to over bake it because you will have to put it back in the oven. The apple topping, oh the apple topping! 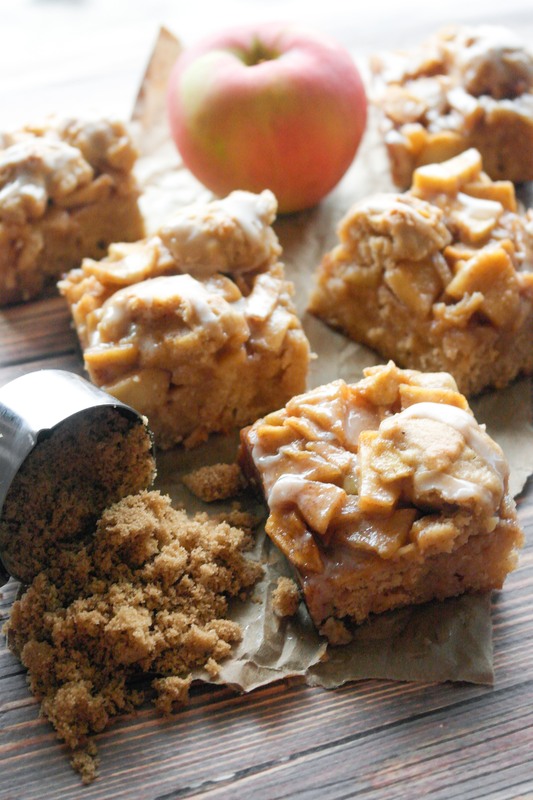 There is nothing as good as apples with a little bit of a cinnamon and brown sugar. (There’s my apple obsessed self taking again.) I used honeycrisp apples because they are crunchy so when they bake, they don’t get mushy. They maintain a bit of the crunch, but it’s still delicious. For the filling, I peeled and chopped the honeycrisp apples. Then I threw them all into a pan for about five minutes with some brown sugar and butter. The smell was intoxicating. When the cookie base is done, I poked a few holes in the base so the apple juices could sink in. Then I poured the apples over the base. I spread the last half of the dough over the top and popped it back in the oven for 20-25 minutes, or until the top was just getting little brown edges. You will love these bars, I promise. 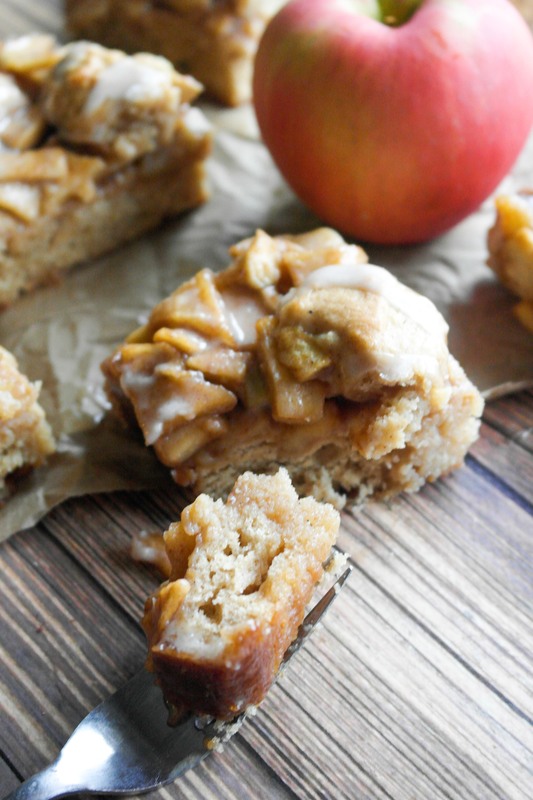 If you love apples as much as I do, you will probably cry (like I did) when you tried these fresh out of the oven. 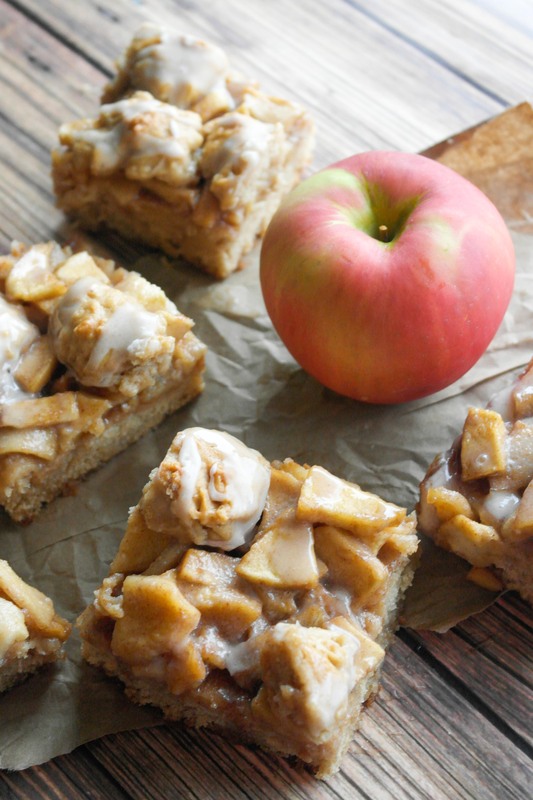 Question: What’s your favorite fall (apple) dessert? Preheat the oven to 350 degrees Fahrenheit. In a separate bowl, mix together the flour, baking powder, baking soda, cream of tartar, salt, cinnamon and nutmeg. Set aside. In a bowl, cream together the butter and sour cream with a hand mixer or stand mixer. Add the sugars and cream until smooth and fluffy. Add each egg one at a time and the vanilla. Add the flour mixture in two increments and mix until fully incorporated. Press about 1/2 of the dough into a greased 9″ x 9″ pan. It may seem like a thin layer, but it will puff up. Bake for 15- 20 minutes. Try not to over bake the base, because you will have to put it back into the oven. When you remove the cookie base from the oven, poke a few holes in it. This will help the apple juices sink into it while it’s baking. Peel and chop up the apples. Place butter, apples, sugar and cinnamon in a pan on the stove top. Mix apples for about 5 minutes on medium heat, or until slightly softened. They will finish softening while baking. Layer the apples onto the cookie base. Take the other half of the cookie base and layer it on top of the apples. Bake for 20- 25 minutes, or until the crumbles on top of the cookie are light brown. Let the bars cool for at least an hour before putting on the glaze. Combine all of the glaze ingredients in a bowl. Cut bars when fully cool. I recommend letting them sit on the counter for a couple of hours.